The cardiovascular system serves to carry essential compounds to the tissues and to remove metabolic by-products. It also plays an important role in maintaining homeostasis, and functions directly or indirectly in the regulation of body temperature, oxygen supply, nutrient distribution, water and electrolyte balance, and endocrine activity. Consisting of a pump, connecting tubes, exchange membranes and blood, this system is governed by a diverse and complex array of regulatory mechanisms, encompassing central neural, autonomic, endocrine, paracrine, and autocrine control. Drugs used in the treatment of cardiovascular disease are disseminated widely in western industrialized countries. In the US alone, nearly $18 billion was spent on drugs for the treatment of cardiovascular disease and stroke in 1999. This Handbook contains records for all the major drugs that directly affect the cardiovascular system. 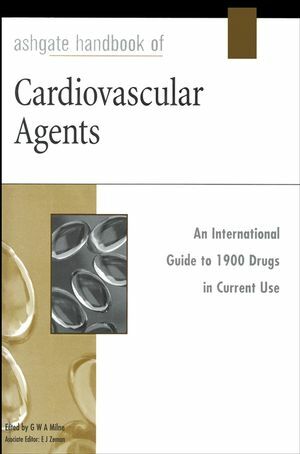 Monographs are provided for over 1900 cardiovascular agents. For each main entry, the following information is provided: the chemical name and a list of proprietary names and synonyms; the Chemical Abstracts Service (CAS) Registry Number; the European Inventory of Existing Commercial Chemical Substances (EINECS) number; and the Merck Index (12th edition) number. The physical properties of each compound are described and the known biological activity and indicated applications are presented. The structure of each compound is provided, together with a summary of the acute toxicity data associated with it, and the manufacturers and suppliers of the drug are also given. Indexes, including a master index of names and synonyms, are appended. G W A Milne was a Senior Researcher at the National Institutes of Health in Bethesda, MD, USA for 35 years where he worked on the use of spectroscopy for structure determination of organic compounds, and on molecular modeling in the design of drugs for the treatment of cancer and AIDS. He has been active for many years in the fields of chemical information and chemical computation and is the Editor of the American Chemical Society’s Journal of Chemical Information and Computer Science; Gardner’s Chemical Synonyms and Trade Names, Eleventh Edition (Ashgate); and Drugs: Synonyms and Properties (Ashgate). E J Zeman received her PhD in physical chemistry from Northwestern University and completed a post-doctoral fellowship in computational chemistry at the University of Pittsburgh. She has worked in science publishing for over 12 years and has been on the staff of several peer-reviewed scientific journals. Dr Zeman has also written for and edited magazines, monographs, encyclopedias and reference books. Antianginal, Antiarrhythmic, and Cardiotonic Agents. Blood Formation and Coagulation Agents. Water and Electrolyte Balancing Agents. Part III: Manufacturers and Suppliers Directory.